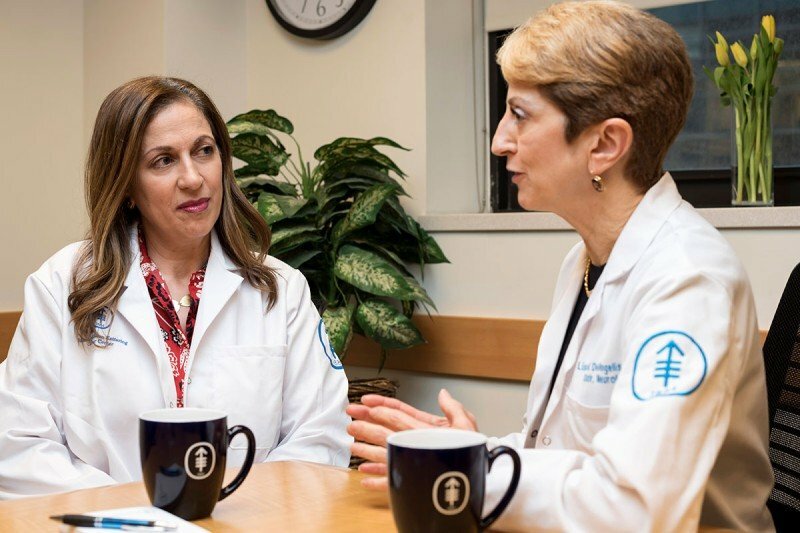 Lisa DeAngelis (right), who is MSK’s acting Physician-in-Chief, is searching for ways to improve outcomes for people with brain tumors and neurologic complications of cancer. Viviane Tabar studies the use of stem cells to model cancer and to repair brain tissue after injury. 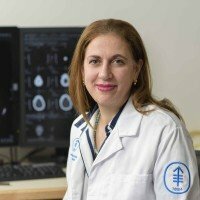 Dr. Tabar also leads the Multidisciplinary Pituitary and Skull Base Tumor Center at MSK. MSK is improving the lives of people with brain cancer and helping their often stressed-out families. Two of MSK’s top brain cancer experts reflect on how they care for people and recent advances in treatment. There are few diseases as feared — or as challenging to treat — as cancers of the brain. But there are very few specialists dedicated to treating brain cancer who have the expertise and compassion of Lisa DeAngelis and Viviane Tabar. Dr. DeAngelis is acting Physician-in-Chief and Chief Medical Officer, as well as Chair of the Department of Neurology. Dr. Tabar is Chair of the Department of Neurosurgery. In addition to treating patients, both doctors also conduct groundbreaking research. We recently spoke with them about what people facing brain cancer need to know and how MSK cares for them. Lisa DeAngelis: People have very different ideas about what makes life meaningful. It’s important that we know what that means to all of our patients, so we can not only treat their disease but also help guide them through difficult decisions and honor their wishes and their values, especially if they reach a point at which they may not be able to articulate those. So you need to know that early on. Viviane Tabar: I agree. I remember early in my career treating someone who had a large benign tumor, and we were very proud to have removed it completely. But the patient was not really satisfied because she turned out to be a wine connoisseur and she lost her ability to smell. That impacted her quality of life far more than we had anticipated. Obviously, some people deal with much more challenging neurological and psychological problems related to a brain tumor diagnosis than that. That kind of experience is why I often tell my trainees that your first ten years as a surgeon are focused on developing your skills and becoming a good surgeon. But what’s more challenging afterward is developing good judgment. Dr. DeAngelis: It’s also really important to understand that treating the family is an integral part of treating the patient. It’s the family who bears the consequences if the person’s personality and identity are changed dramatically by their illness. In some ways, the family struggles more than the patient. I’ve often said to people, “This is going to be harder on you than it’s going to be on your spouse,” or father, or whoever the patient is. I think that’s something that we in the neurology world confront much more frequently than other doctors. It's also really important [to them] to understand that treating the family is an integral part of treating the patient. It's the family who bears the consequences if the person's personality and identity are changed dramatically by their illness. Dr. DeAngelis: Having taken care of people with glioblastoma and malignant brain tumors for more than 30 years, I really have seen a noticeable improvement in the quality of life for people who live with these diseases. One reason is newer drugs, such as temozolomide [Temodar®], which is much less toxic than prior chemotherapies and better tolerated. Also, the addition of bevacizumab [Avastin®] has helped patients avoid corticosteroids for brain edema or swelling and their side effects. That’s enabled patients and families to make the best use of whatever time they have left. The other thing that’s changed is that there are people who are living many years with this illness. That’s not something that we saw — or saw very rarely — in the ’80s and ’90s. It’s important to understand that the proportion of these people is very small. And the fact that we haven’t substantially prolonged life for more patients is the most important problem that we struggle with. But those people who live for six or seven years after treatment often do extraordinarily well. They are able to work and enjoy life. That’s a dramatic change. Dr. Tabar: In the neurosurgery department, we’ve evolved over the last ten years to put a greater focus on offering surgery while maximizing function. That’s in part because of technologies that I expect will continue to evolve and allow us to offer people more options. Take, for example, patients who suffer from brain metastases, when cancer spreads from another part of the body. Traditionally they were told that their life expectancy was a year or less, and I would admit that they perhaps received less attention from surgeons in the past. But today, we often focus our discussion on what surgery can do to improve quality of life. If a patient suffers from a weak leg or a weak arm, we are more likely to offer them surgery if we think that it can help them overcome that deficit, even if we cannot impact life expectancy. In the neurosurgery department, we've evolved over the last ten years to put a greater focus on offering surgery while maximizing function. Dr. DeAngelis: MSK is about the people. It’s about the team. We have a fantastic multidisciplinary, collaborative team — people with deep expertise in their respective fields, such as neurosurgery, radiation oncology, neural pathology and neural imaging, and so on. We work incredibly well together, which doesn’t mean that we always agree with each other. In fact, some of the most valuable exchanges are when we don’t agree. Somebody will bring another consideration to the table that makes you think about a problem or see a patient from a different perspective. What we bring to the table collectively far exceeds the sum of the individual parts. Dr. Tabar: I agree. We have people with deep experience as well as younger people who have a different perspective — people who have one foot in the lab and one foot in the clinic. It’s also very inspiring to be surrounded by people with genuine dedication to the patient. Dr. DeAngelis: Our global team approach is so different from other institutions that it does sometimes take patients and families a little bit of time to acclimate to it. But I think they rapidly come to appreciate the benefit of it. 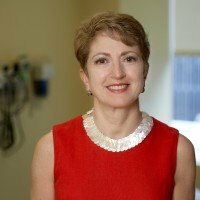 Dr. Tabar: It’s not uncommon for us to say to patients, “Well, let me discuss this with my colleagues and we’ll get back to you.” I enjoy when the patient is a little incredulous that you get back to them the following day with an opinion from several experts that would have taken maybe a few months to get individual appointments with. In January 2011 my mother was admitted to MSK and diagnosed with GBM. Surgery, radiation and chemotherapy followed. Mom passed away five months after diagnosis. However, she was cared for by the most professional and compassionate team of physicians. That team included Dr. Tabar. We will never forget how Dr. Tabar cared for Mom nor her respect and concern for my sister and I.
Dear Christina, we are very sorry for your loss, but glad to hear that your mother was well cared for. We will forward your kind words to Dr. Tabar. Thank you for your comment, and best wishes to you and your family. In June of 2007 I was operated on by Dr. Tabar and I am happy to say that I am still able to enjoy life. I play bridge and still work part time. Many thanks, to Dr. Tabar. Dear Irene, we’re so glad to hear you’re doing well. We will forward your comment to Dr. Tabar. Best wishes to you! Dr. Tabar stayed late on Friday night July 2016 to do my brian biopsy. She is simply the BEST in so many ways. Also Dr. deAnglis is a doctor that did the research for my rare PCNSL cancer that gave the exact recipe for my treatment. Over two years later I am living the Best life ever! Thank you to two amazing Doctors! Dear Nez, we’re so glad to hear you’re doing well. Thank you for your kind words. We will forward your message to Dr. Tabar and Dr. DeAngelis. Best wishes to you!